Relocated to Hillman City after 17 years in the Central District, Amy’s Merkato is many things–a comfortable cafe, a shop selling spices, wine and selected dry goods, and at its heart, a bakery supplying fresh injera to East African restaurants and shops around Seattle. The cafe will be keeping bakery hours, opening early most days. The Union Bar space reborn as the Twilight Rainier–a south end sister of the longtime CD haunt Twilight Exit. It’s Hillman City’s basic full-service watering hole: a full bar, comfy, a bit loud, and a solid pub menu. Ice cream… and hot wings. Hillman City’s local brewery is also a comfortable, spacious room for chatting, playing games, reading. Usually 8-10 beers on tap, from IPAs to dark ales and goses. Full-service physical therapy clinic at the corner of Rainier and Orcas. 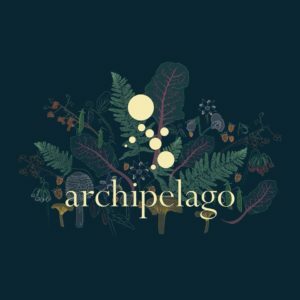 Chef Aaron Verzosa and partner Amber Manuguid have opened Archipelago, serving progressive Filipino American cuisine drawing on Verzosa’s experience working in culinary research at the Modernist Cuisine lab in Bellevue. The new spot will be more fine dining than casual, with two seatings per evening featuring an 8-10 course tasting menu. Check them out on Instagram or Facebook. 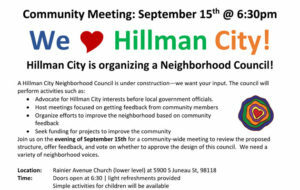 •	Advocate for Hillman City interests before local government officials. Join us on the evening of September 15th for a community-wide meeting to review the proposed structure, offer feedback, and vote on whether to approve the design of this council. We need a variety of neighborhood voices. ڨحوٛڠ هلون توڠبيه ڬاوء لکاو دعــا داي سعــاي حي بغـاي مـآي جنــوم ڬاوء ددالــم بغــوء حيــد جمعيـــة ڨــوء ڨلاي داغب دغــاي کوڠ حــي ڠــاء پو ڨاء هغـاي 15 بلآن 9 ني ڨــاء مـــوٚٓڠ 6:30 أونتوق حــي مشورة ڬاوء حــي ڠــاء جياۛڠ هســا جمــاعــة داغب کـــروڠ حيلمين (Hillman) نــي. ڨحوٛڠ هلون څــاوء بغــوء بغـاي داي سعــاي ڨتمــاۛ سناٛڠ حوٚڠ ڬاوء دان ددالــم مجلس نن غــاي مدآ أوغــآڠ حــي لآڠ بغـــاي ڨاڠ واٚء توي بهســا٢ داغب داي سعـآي نن. Hãy tham gia cùng chúng tôi cho một cuộc họp cộng đồng vào ngày 15 Tháng 9 lúc 6:30 chiều để thảo luận việc thành lập một hội đồng khu phố Hillman thành phố. Chúng tôi muốn bạn dịch vụ đầu vào và dịch sẽ có sẵn trong ngôn ngữ của bạn. 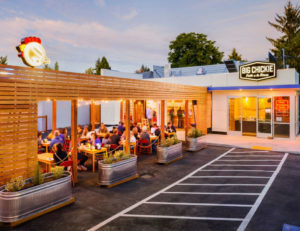 Occupying a former gas station at the corner of Rainier and Findlay, Big Chickie has become a key neighborhood hangout for Hillman City families. With a casual, partially-enclosed dining area carved out of the parking lot, and generous plates of brasa-cooked (charcoal rotisserie) chicken, potatoes and uncommonly good side salads, Big Chickie is a reliable lunch and dinner option for neighbors and working people passing through.